Why not enjoy your free time and let the tedious work to a professional handyman? At Handymen Supreme, we specialize in handyman jobs such as hanging and fitting services in all London areas in M25. As all other hanging operations, you should not do a TV wall installation by yourself either. Leave it to the professionals. In case you need high-quality TV Mounting services, you can fully rely on Handymen Supreme. Enjoy Picture Hanging Fittings Service North London and London! Apart from hanging services, we also perform curtain fitting service North London, blinds fitting service North London and curtain installation North London. We also cover all other M25 London areas. We strive to provide affordable hanging fitters who possess years of experience in the various handyman jobs. 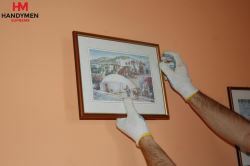 Book Your Professional Hanging and Fitting Service in London Now! Simply pick up the phone and dial 020 3746 5607 to get a price estimate on the work you need done. For larger jobs we often prefer to get a look at the site in person before giving you a quote, but for our professional hanging services you can usually request a no-obligation estimate over the phone. You can call right now - our team are standing by to talk to you 24 hours a day, 7 days a week. And of course you can also reach us via our chat facility or handy booking form.